Our site at Pouquelaie Vinery is in one of the most peaceful corners of Guernsey and only 20 minutes away from St Peter’s Port, the capital of the island. The land comprises of three fields, 2 greenhouses and scrub land sloping down to the beach. The high vantage point faces out west across the sea, with views from the south westerly point of the Hanois lighthouse to the North westerly Lihou Island. In between are sandy beaches, just a two minute walk away down quiet lanes and sunken old paths. D’Arcy is a Silver accredited guide and worked for 3 years with Island Rib Voyages Ltd as their main eco-guide. 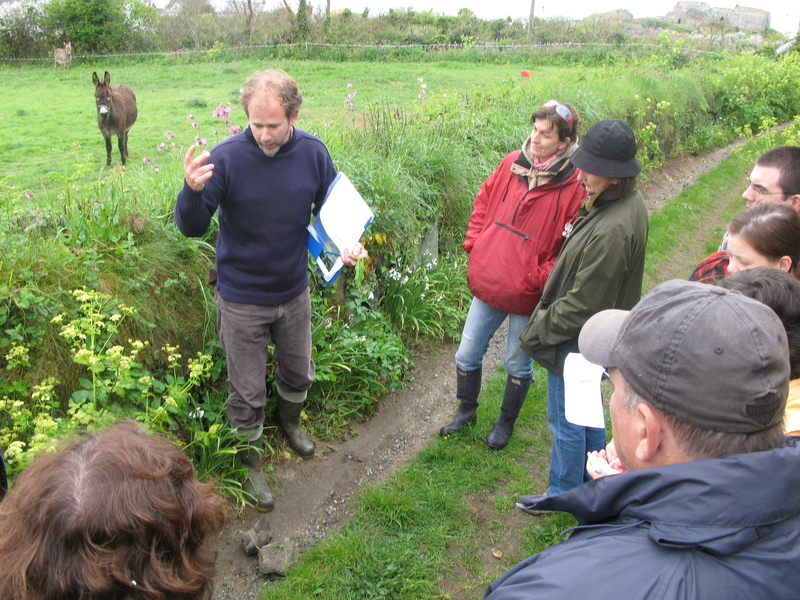 His passion is for life afloat alongside living with the land and in particular wild foraging (completed a number of foraging courses in UK), discovering what nature’s harvest can provide. He holds a Certificate in Adult Education, and has also worked with educating young people. His teaching approach is inclusive and imaginative. His background is with leading young people in the Canadian outback and States with canoeing and wilderness camping, climbing, surfing and sailing. He grew up on a small holding with his parents in Somerset raising their own meat, grinding their own wheat for flour and using the wood they grew and chopped down to keep warm. More recently he has attained NCFE level 3 bushcraft, SPA climbing, BSAC Snorkelling instructor (plus PADI assisted instructor), Forest School training and now works for The Education Dept as the Outdoor Education Manager. Tara is a Guernsey woman and qualified permaculture teacher. Growing up on the beach she foraged for winkles and fished with her Pop off the west coast. Her love for the sea has taken her to study marine Zoology, sail with D’Arcy on their 22ft gaff rigged boat to Italy, guided and skipper for Island RIB Voyages Ltd. and immerse herself in the sea as often as she can. She is an RYA Powerboat level 2 Instructor and whilst in Guernsey you can undertake a 2 day RYA powerboat level 2 course with The Guernsey Sailing Trust. Now with a larger boat, she boat schools/home schools her two sons, as part of a flourishing Home Educating community (called Living Education Guernsey – L.E.G), where they meet up each week for nature club, co-learning, sailing and a wild wordsmiths group. Seaweed features highly in her life making herbal balms with it, eating it, running workshops on the seashore/earth education and bathing in it!